Dinosaur Hunter Book. Life on the ranchlands of Montana comes with more than its share of trouble. The cowboys who work this untamed stretch of the American West expect it - and some of them even enjoy it. One of them is Mike Wire, a former homicide detective who worked the decadent hills and valleys of Hollywood. Having enough of the murder and mayhem of the big city, Mike retreated to this far corner of civilization to spend his days running the Square C Ranch and pining for the ranch's owner, Jeanette Coulter. But Mike is soon to learn murder and mayhem can happen under Montana's big skies, too. The badlands aren't home to just horses, cattle, cowboys, and cowgirls. Beneath the earth lie enough dinosaur fossils to fill several museum collections - and make a fortune for whoever claims them first. When a paleontologist and his attractive young assistants arrive at the Square C hoping to dig, Mike senses trouble is clinging to them like mud and manure, for once discovered, those bones won't stay buried, and not everyone hunting for them is doing it in the interest of science. Soon Mike will have to combine everything he learned as a cop with everything he knows as a cowboy to protect the people and the land he could never live without. Bestselling author Homer Hickam enters new territory here to write about a world that has fascinated him for decades, drawing on his own experiences fossil-hunting and getting to know the people of Montana. 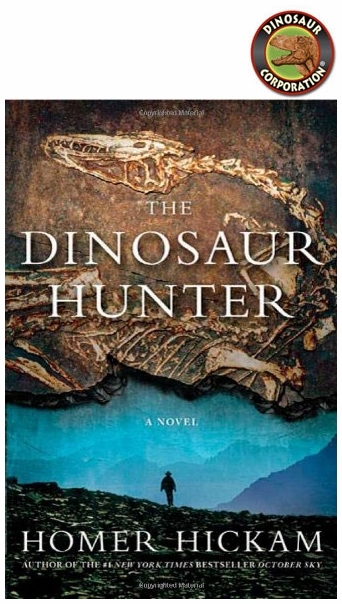 In the vein of the novels of Larry McMurtry and Tony Hillerman, The Dinosaur Hunter pays tribute to the American West and the attitudes that make it such an incomparable part of the country.